Curious about aerial arts? Want to know how to balance your friends on your feet? This is your class!!!!! 1-2x a month we offer this mix of Trapeze, Aerial Silks, Lyra and Partner Acro. So much fun you’ll forget you’re exercising your mind, body and spirit! Limited room, you must register in advance. This is a beginner class, no experience is required. Hammock is an aerial fabric hung in a U shape. This class will teach basic mounts, poses, drops and choreography from a sitting and standing position. Conditioning and flexibility exercises using the apparatus and on the floor will be included. This is a mixed level class. Beginner students will learn the basic positions while more advanced students will add on to these positions. No prerequisites, all levels are welcome. In Acro, we play with good alignment and momentum to let the “base” balance and move a partner (flyer). Everyone can practice each part to their own comfort. New students will learn the basics and experienced students will practice more challenging poses and transitions. It’s a low-stress, safe, and fun environment to improve fitness, balance, and communication. Wear comfortable clothing – you might get turned upside down! Please avoid heavy lotions and scents, natural or otherwise. We love you, we just might not want to smell like you all day! No prerequisites, all levels are welcome. No partner necessary! Tight Wire Walking is a traditional circus art performed on a narrow metal cable under tension. It is a challenging mental and physical activity of balance and focus. This class will teach various steps, poses and techniques for fluid movement on a safe 2′ wire above the ground, while being spotted by an instructor. A class for students interested in dance, posture, balance, and aligning brain with body, as wire dancing is as much about mental calm as it is physical stability. No prerequisites, all levels are welcome. A full upper and lower body workout with stretching. Half the class will use aerial and ground exercises to condition and strengthen, while the other half we will stretch and lengthen those muscles. Can't do a pullup? Come to this class. Can do a pullup? Come to this class and do more! Dont have your splits? Come to this class. Already have a split? Come to this class and work the oversplit! A great class for aerialist and non-aerialists alike. Bring water, comfy clothes and your buff selves. Trapeze and hammock in one class! We will explore movement specific to each apparatus and where the overlaps can happen while working dynamic and static skills that find flow and technique. We will also experiment and learn pathways together to create original sequences. Prerequisite: Students must have completed at least one or more full seven week sessions of Beginner Silks, have instructor approval, or have trained at another facility. Students must be able to basic climb, foot knot in the air, invert to crochet hooked feet in the air, and x-back in foot locks to enroll in this series. 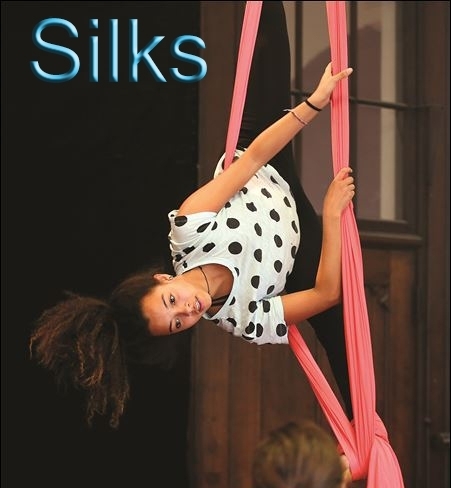 Prerequisite: Students have completed at least one or more full seven week sessions of Level 2 Silks and received instructor approval, or have trained at another facility. Must have scissor hip key, straight leg straddle climbs to top, understanding of s-wrap, ss hook, and able to stay in the air for 3-5 minutes. This class will be explore dynamic movement, intermediate rope vocabulary and some advanced silks concepts with lots of conditioning and head games for the theory enthusiasts. Plan to bring layers to protect your body, including stretch jeans for rope. Please wear comfortable, close-fitting, yoga-type clothing that covers armpits, waist and backs of the knees. Men may want to wear briefs, not boxers. No hand lotion (it will interfere with your grip), and please no heavy fragrances, natural or otherwise. Students will be most comfortable practicing on an empty stomach, a two hour window between your last meal and class is recommended.